Waiting for the weekend or more precisely Fridays was exciting during my childhood days in North India. The weekly hassles and chores settles down on Friday for a common homemaker like my Mom. For us, the excitement was nothing other than the Friday night movies. Every Friday they play Hindi movies for the air force families. We would wait for my Dad to return from work and have a glorious ride on our scooter to the movie theater. There will be other families who would join us at the theater and it was the fun time together. My brother would keenly wait for the intermission of the movie. As a ritual he runs and gets the money from Dad and buys the hot snacks from the indoor cafe and brings the brown bag back to us. My favorites were the hot and spicy snacks like Pakoras, Samosas, Chaats etc. This happened almost every week and as kids and we literally went there to have the snacks and fun with friends. My brother would sleep by the end of each movie and my parents had to carry the sleepy kid to the scooter. It was part of our weekly routine. Years later I got married and came to US during a winter time. I still remember the jollity and amazement of experiencing the first glimpse of snow showers. The bone chilling cold winter was new and unendurable. Layers of clothes gave me the comfort and warmth. Hot beverages like Tea and Coffee were never my favorites before, but slowly they became my warm companions. We would go for a ride all bundled up and swing by this small restaurant that served hot Masala tea and the best samosas. A cup of hot Masala tea and a piping hot freshly fried spicy and crunchy Samosa was the perfect snack to keep us warm on those cold days. Oh that nostalgia is so piquant that it’s tickling my taste buds and impelling me to make some hot samosas!! I had tried different versions of samosas before, even a baked one. But my family was never fond of those. So finally I tried my hands on frying them last weekend when it was snowing heavy outside. The weather was favorable to enjoy a hot and spicy snack and it was an instant hit. Usually the younger ones don't finish the whole big samosas, so I decided to make mini samosas and it worked out perfectly for my family. 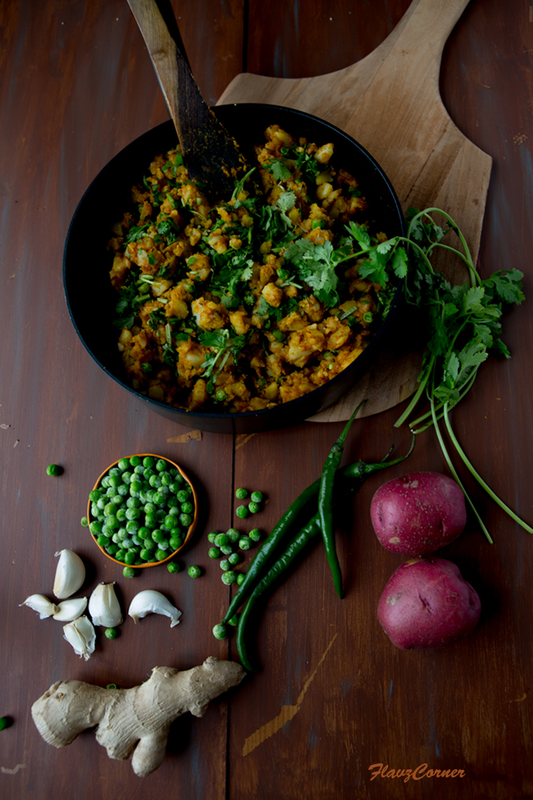 Do give this recipe a try and let me know how it turns out for you. Shot under the fading light of sun in the snowy evening. To save the time, you can make the filling the day before and refrigerate. Just make sure to get it to room temperature before filling the samosas so that you can cut down the frying time. Mix salt, ajwain/carom seeds and flour in a mixing bowl. Add 2 tbsp of oil and mix with the flour to incorporate it well. Use your hands to feel the wetness of the dough. Now add water and knead for 5 to 6 minutes to get a tight but flexible dough. Cover it with a kitchen towel and let it sit for 15 minutes. Meantime prepare the filling. Splutter 1/3 tsp of cumin seeds in 1 tbsp of oil in a non stick pan. Add ginger garlic paste and green chilies and saute till cooked. Lower the flame and add all the spice powders, Mix well and add 1/4 cup of water and let it cook till the raw smell is gone and forms a paste. 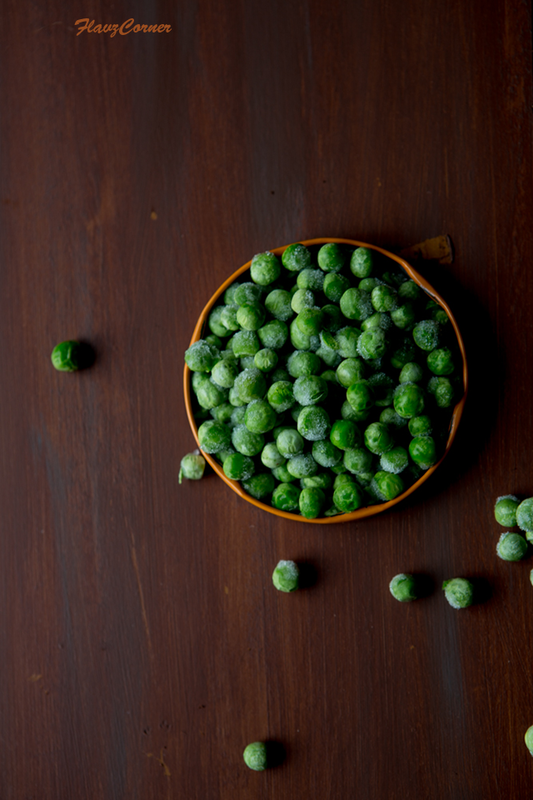 Its time to add the green peas. Cook covered for 1 minutes. Mash half of the potatoes out of the cubed potatoes and add to the masala and mix well. Add rest of the cubed potatoes and mix well. Check for the salt and spiciness. Turn off the flame and add the chopped Cilantro and keep it aside to cool little bit. After the filling cools a bit, add the lemon juice and mix well. Flour the rolling surface and knead the resting dough for couple of minutes and divide them into 10 equally sized balls. Roll the ball into a circle. Cut the rolled circle into half using a knife. Apply some water on the edge of the cut sides. Take one half and make a cone out of and secure the side where the water is applied. Fill the cone with 1 1/2 tbsp of samosa filling. Apply water on the open side and pinch them to stick together and fold the pinched edge so that they can sit on the counter like a triangle with a base. Make rest of the samosa like that. Heat a kadai or frying pan with enough oil for deep frying the samosas. Once the oil is really hot, start frying the samosas. Flip them in between. 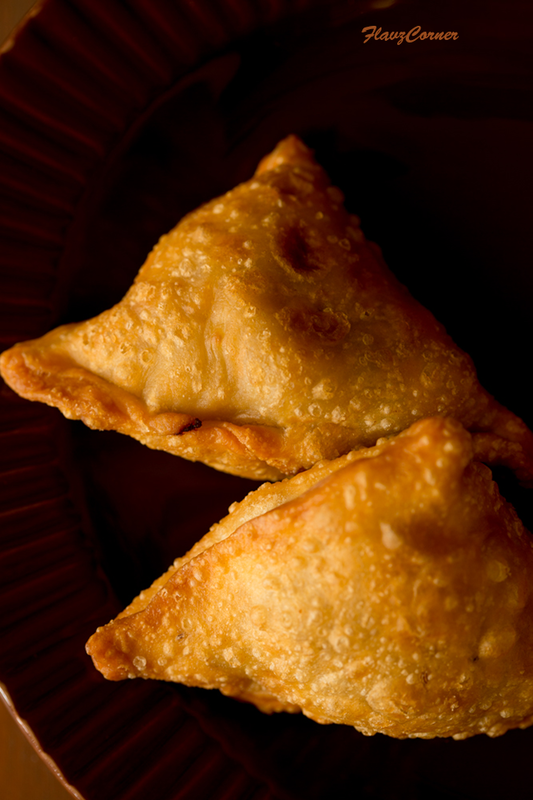 The samosas are done when they attain the perfect golden yellow brown color. Fry rest of prepared samosas in batches and drain excess oil on a paper towel. 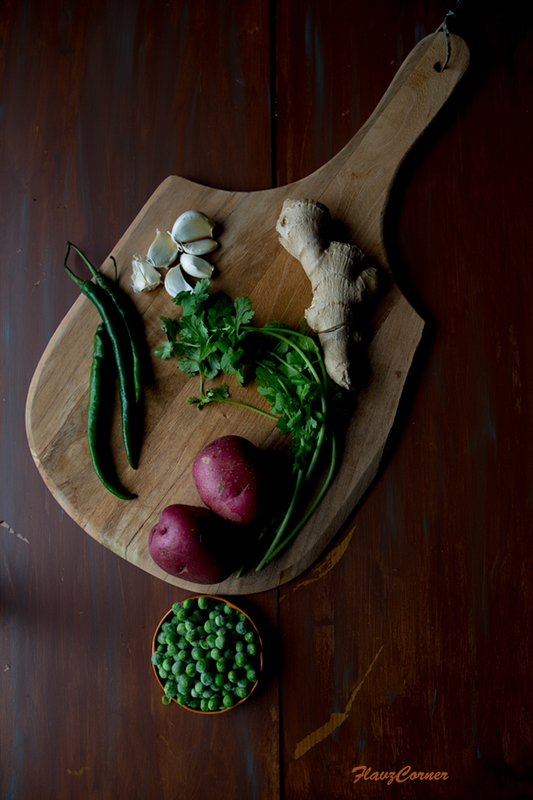 Enjoy the hot samosas with your favorite chutney or ketchup. Any left over samosas can be stored in air tight container in the refrigerator. They can be reheated in a toaster oven to retain the crunchiness or you can bake them in an oven at 350°F for 15 - 20 minutes. You can adjust the amount of spices according to your taste. 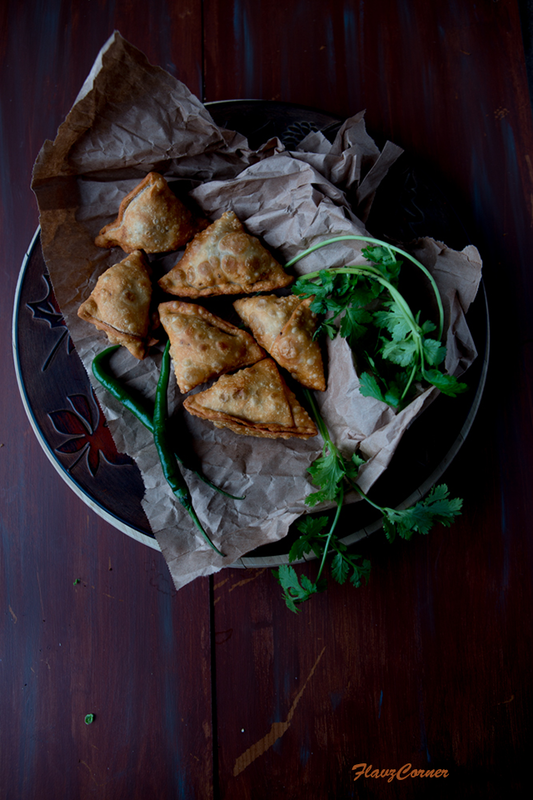 The samosas are usually served with Tamarind Chutney or Mint Chutney. Scooter ride was so much fun right! the front space was kids' favorite spot. Snow definitely makes us crave for fried food. Samosa looks sooo yummy and mini is so cute. Fried stuff is always delicious! 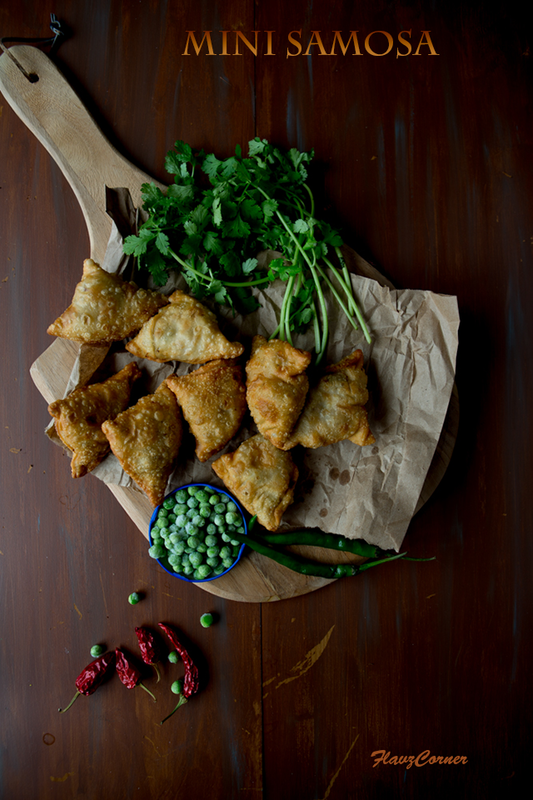 Those samosas look droolworthy!